You are here: Home / News / ICE-TAGS South Africa Works Hand in Hand With Crises On Call To Save Lives. ICE-TAGS South Africa Works Hand in Hand With Crises On Call To Save Lives. Wearing an ICE Identification Bracelets should be a non-negotiable part of everyday life for everyone, from infants to adults. Allergy bracelets for kids and Medical bracelets for kids are an essential part of protecting kids while they’re out of the home, whether at school, with friends or on activities such as school outings or camps. Every adult should also be wearing some form of ICE-TAGS ID Bracelet or Medical Bracelet, giving everyone a fighting chance of surviving what are potential life-threatening situations and traumatic incidents. ICE-TAGS has taken their commitment to saving lives a step further, by making sure that their customers are able to easily access the Crisis On Call contact form on the ICE-TAGS website, to add another level of protection in emergency situations. When you’re in hospital for a medical procedure that has taken planning and a full workup of your medical information, everything the medical staff needs to care for you appropriately is already in place. The complete opposite of this is what happens when you or a loved one is involved in an accident. Without essential information, it’s possible for highly professional medical staff to compound trauma injuries by using medication that is contraindicated if you are on chronic medication or have allergies. An allergy to penicillin can prove fatal. This is the go-to antibiotic used to prevent infection of wounds sustained in an accident or trauma. If you’re unconscious and have no allergy bracelet or medical bracelet containing vital information that could save your life, no one will know about what could cause further damage in the process of saving your life. With ICE Identification Tags from ICE-TAGS and, Crises on Call, your chances at getting the right help in emergency and trauma incidents is at the highest level in terms of actions that can be taken to save your life. People have been known to have road accidents due to a heart attack, and, if the right medical information isn’t available to first responders, they will not know that you need specialised emergency treatment for a heart condition. Motor vehicle accidents are among the major causes for fatalities, and, since none of us can predict whether we’ll be involved in one or not, being prepared for the worst is your first line of defence. If a car is involved in a life threatening collision and the occupants are trapped, it’s essential that you have a service like Crises on Call added to your emergency identification, so that all the relevant emergency services can be called to the scene as quickly as possible. Life saving measures at the scene of the accident will make all the difference once you’re transported to a hospital, where medical personnel will be able to use the information provided by your medical ID tag to take appropriate action. 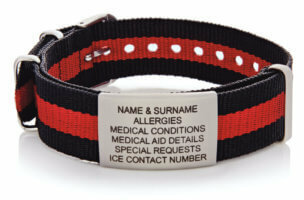 Contact ICE-TAGS South Africa for the widest range in ICE Identification Tags, Emergency Medical bracelets and allergy bracelets. This is a team dedicated to doing all they can to save lives, increasing the chances of saving a life by adding a link to Crisis on Call on their website. Get your ICE-TAGS ID Tag today and speak to the team to find out more about what you can do to ensure that you and your loved ones are covered for all emergencies.